November 5th is an important day in Back to the Future (1985) lore so today seems like an appropriate time to call your attention to the book I'm reading right now. 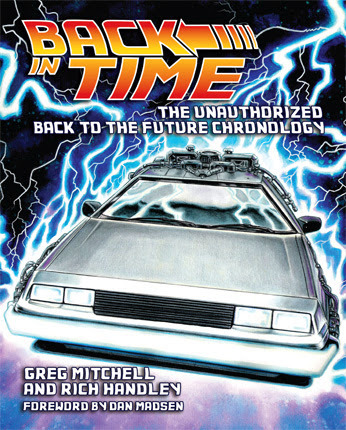 Back in Time: The Unauthorized Back to the Future Chronology by Greg Mitchell and Rich Handley is the latest master-work from Hasslein Books, an imprint fast developing a reputation for intricate, comprehensive, exhaustively-detailed texts about beloved genre franchises. I already own Handley's Planet of the Apes Chronology, and Planet of the Apes Lexicon (for which I submitted a preface...), and the quality of this work rivals both of those impressive texts. This Back in Time book is filled with beautiful illustrations, flow-charts, and family trees, and is appealing simply on the basis of the dynamic visual lay-out. In terms of content, Back in Time consists of a meticulous time-line broken down into 15 segments ranging from "prehistory" to "2015 and beyond." The book also includes five appendices, which gaze at the history of Hill Valley, and even the ubiquitous Courthouse Square (where the clock tower plays an important role). I also loved the appendix which traces the various "family trees" of generations of Tannens, McFlys, Browns, Stricklands, Parkers and so forth. This seems a crucial element of the Back to the Future mythos, as the "series" concerns a core group of families that keep reliving a similar series of events (in the same places),. The first thing that may strike the reader about the book beyond the attractive graphic design and artwork from Pat Carbajal is the fact that the Back to the Future "universe" (and franchise) is a hell of a lot more expansive than it might appear at first blush. The chronology thus includes not merely the three feature films (circa 1985 - 1991), but an animated series, three comic book series, Happy Meal Boxes (! ), commercials, music videos, and a card game. I frankly had no notion that half of this material even existed. Delightfully, the book provides all the details necessary to finding a story, and understanding where and how it fits in the overall time-line. An added bonus is that the authors add scientific "notes" to many entries, such as those involving the Jurassic and Cenozoic Period, to sort of "accuracy check" the franchise. The approach -- as that level of detail suggests -- is one of respect and complete-ism, if there is such a word. Again, I'm bowled over by the level of detail found in the text, and must credit, at least partially, Rich Handley, the co-author. 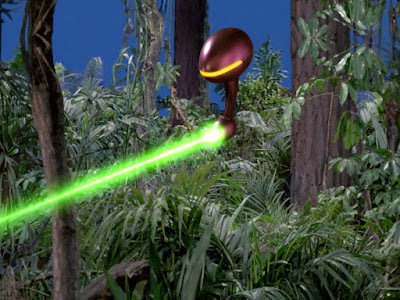 He is a great writer for this sort of material because he approaches franchises like Apes or BTTF like some obsessed archaeologist reconstructing an ancient culture from diverse, seemingly unconnected clues.. He is constantly organizing and re-organizing chunks of data so that a new, "big" picture of the overall story emerges. I (clearly...) don't know Back to the Future as well as Planet of the Apes, but for fans of the series, this chronology is absolutely a must-have if you seek be a student in that archaeology class, and desire to put all the pieces together so as to glean a sense of the "story" from the distance of an objective observer, in accordance, perhaps with Hasslein (Books?) theory of Infinite Regression. Back in Time: The Unauthorized Back to the Future Chronology is available at Hasslein Books and at Amazon.com. John, like you, I purchased and enjoyed reading both Handley's Planet of the Apes Chronology and Planet of the Apes Lexicon books. Like your new books, I will have to purchase Back in Time: The Unauthorized Back to the Future Chronology. Great review. The X-Files Promo: "Folie a Deux"
The X-Files promo: "Bad Blood"